2 Why is Store Manager? Magento Store Manager is a Windows application that can be of service to you and your eCommerce site. It allows for the effective management of your online store and saves you both time and money by simplifying your operations day to day. There are also add-ons such as Magento QuickBooks, Magento Shipping Integration and more that can be added to this product. 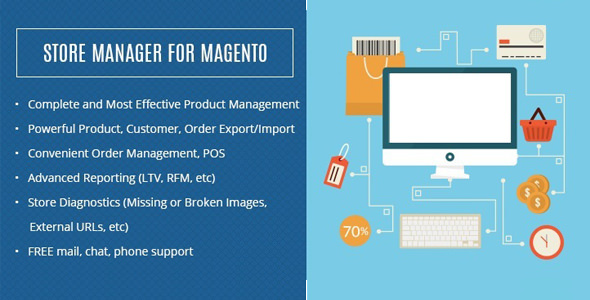 There are at least ten different categories in which Store Manager can be very effective for those using Magento. These include Product Management, Import/Export Wizard, Customer and Order Management and so much more. For example, in the Reports section, you have the management of reports that are easy to do. It also contains up to 10 different built-in reports on customer data, inventory and sales. Customer Management section can feature management of all customer data in one place, export to Excel and administration of groups and single customers. The Order Management section can assign Order to multiple categories, clone, copy and paste as well as edit and delete Order. Multi- Editor section provides advanced modifications to products such as fixed value set as well as fast stock, status and quantity changes. Category Management allows for fast import/export categories. It also allows for the sorting by order of categories. Multi-Store Support allows the management of store views and many different stores at the same time. It also offers connection and administration of different databases. Advanced Features include Raw Table Editor for editing your pure database, as well as partial restore and backup operations. Under Order Management it will conveniently filter orders by time frame and preview order details and orders to your eCommerce store. This is a small sample of the items that this particular Windows application can take care of for you. Saving time and money is what this application does. With the automation of many tasks, it saves you time that can be spent on other aspects of the business. This application is constantly being updated with new features and is very stable and reliable. There are different versions that are available with this program. They are Basic, Professional, and Enterprise. Each one will cost differently. Basic runs for $249, Professional goes for $499 and the Enterprise version which is coming soon will cost eCommerce users $999. There are differences in these programs and consultation would be needed to find the right choice for you. If you have an eCommerce site in Magento, it would be a good idea to consider getting this particular application. While it may not be cheap, the price is well worth the problems that this application can resolve. It is a good way to automate tasks and have the information needed at a glance. Time is money and this application will save you both. This application can also speed up doing business and leave more time to yourself. So if you are considering any type of application for your eCommerce business, think about the Store Manager for Magento. It can take some of the stress out of managing your business.